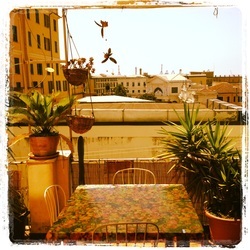 Al Piccolo Principe is located in the heart of Genoa, next to Principe train station, Old Town. The B & B is situated in a building of the XVI century, previously a monastery, preserving a special atmosphere that combines warmth and familiarity. Al Piccolo Principe is the perfect location to easily reach Genova's main attractions, such as the old town alleys (vicoli) the Old Port, the Aquarium, the Ducal Palace, St. Lorenzo Cathedral, etc..
We are also close to bus stops, subway, and ferries. If you drive, it is very easy to reach us from Genova Ovest highway exit (five minutes). By public transport you can reach the Fiera di Genova - which also hosts the International Boat Show - within fifteen minutes. The proximity of the train station gives you the opportunity to easily reach the main seaside resorts on the Ligurian coast, from Nervi Camogli, up to the Cinque Terre to the east, from the beaches of Bergeggi Varazze, Varigotti, Finale Ligure, to the west. All rooms have windows or entrance to a large terrace where you can have your breakfast, relax, sunbathe or simply enjoy the sight of Genoa in a single glance, which brings together the big ships, palaces, the view the Lanterna - the symbol of the city - and the life of the port. We offer a family service aiming to make you feel at home, wether you are travelers, artists, workers, friends or lovers looking for a romantic getaway in the beauty of this city caught between sea and mountains.